I work with restorers, museums, collectors, boat builders, boatyards and private individuals. Some of these interesting people are listed below, with links to their web sites. Andy Swift is the owner of Firefly Restoration which specializes in restoring antique fire apparatus. I do most of the decorative painting and gold leafing for Firefly Restorations. The shop is located in Hope, Maine. Firefly does full and partial restorations as well as selling parts and even complete vehicles. CLICK HERE to visit a page describing Firefly Restoration in more detail. Ken Soderbeck has been instrumental in the field of fire engine restoration for many years. He has been a generous and inspiring teacher to me. He is an expert in many separate areas of restoration. He is a historian of the fire service as well as being a hands-on restorer. CLICK HERE to go to Ken's web site. There is a page on this web site that gives more information and photos about Ken's restorations. CLICK HERE to see my page about Ken Soderbeck. This web site lists and links many fire museums from all over the world. It also gives news on events and people of interest. This is my favorite fire museum. It is located in Hudson, New York on the grounds of the Volunteer Firemen's Home. It opened in 1925 to "preserve the relics of the old New York City Volunteers not alone for what they are, but what they stand for". The collection has a good number of vehicles still in their original paint. Here is a web site of a museum in Illinois. It shows them remodeling an old fire house into their museum, developing educational resources, restoring their collection of antique apparatus, and more. It is a fine example of a fire museum and of a museum web site. This is a museum in Phoenix, Arizona. It has its own restoration shop, kept busy by their large collection. Most pieces have been repainted at the museum. There are photos of most of the vehicles on their web site. This museum is located in Estes Park, Colorado. They are "dedicated to the preservation, restoration, and operation of fire apparatus". The collection is used to educate the public through museum tours, parades, fire musters and SPAAMFAA events around the country. This museum is north of Baltimore in Lutherville, Maryland. It has a large collection and many educational displays. They host events in the summer. This is a section of the San Francisco Museum web site. They give a lot of information here. There are not many images. This museum was smaller than I expected, but the collection is first rate. A lot of New York's early pieces were donated in 1925 to the FASNY American Museum of Firefighting listed above. 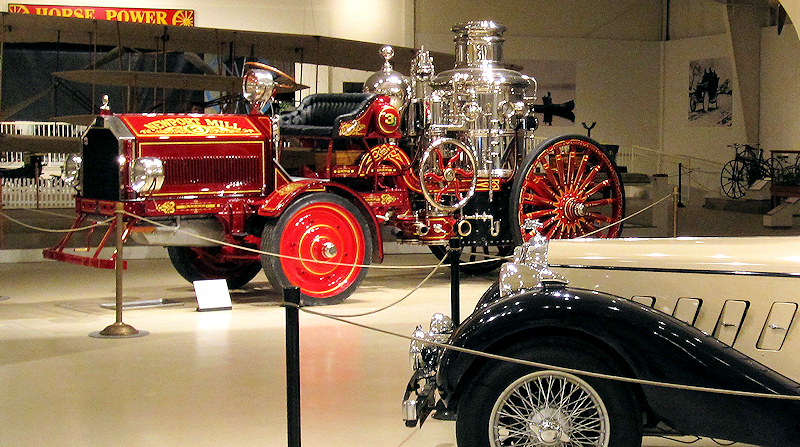 This museum in Dearborn, Michigan has a lot more than just fire apparatus. It is a vast collection of all things mechanical. There are bicycles and locomotives and every kind of vehicle in between. The dozen or so fire engines are very interesting, though I do not think any are displayed on the web site. This museum has no fire engines. It is located in Cincinnati, Ohio and it is dedicated to preserving the history of sign making. It is full of nostalgia and Americana. This is where the neon Golden Arches and the Burma Shave signs have gone to rest. It's full of great lettering. This site deals specifically with hand powered fire engines. It is a good place to begin if you are interested in early apparatus. Yes, this site documents fire hydrants throughout history and around the world. This is the Society for the Preservation and Appreciation of Antique Motor Fire Apparatus in America. This society is dedicated to the hobby of collecting fire engines. There are local chapters around the country. They have a magazine that is a great source for parts and information if you are restoring an old truck. They sponsor meetings and musters all over America. Jim Fetten is a sign painter who specializes in lettering and decoration on modern fire vehicles. He also has worked with Firefly Restorations and individuals restoring engines. Jim is located on Long Island, N.Y. His website shows modern applications of fire service art as well as hand painted transfer ornaments. Pierre Tardif is a traditional sign painter living in Quebec City, CA. The bulk of his work is vintage lettering and signage for businesses with historical interests, car collectors, custom car owners, museums and movie productions. He's done some fine decoration on fire engine restorations. Vintage Fire Truck & Equipment magazine is dedicated to the history and preservation of firefighting apparatus. Each issue contains fire truck history as well as personal stories from American towns and days gone by. The same publisher also makes Antique Power magzine and Vintage Truck magazine. This is an international society of crafts people who apply gold leaf to items from picture frames to manuscripts to architecture to signs to religious icons. If you need something gilded, or want to know more about the process, this is a great source. This boat yard is located on the island of Islesboro, Maine. They look after beautiful yachts with great care. This facility is a full service boat yard that specializes in building custom yachts, both motor and sail. They have a large web site that shows their yachts in many stages of construction. They serve the harbors of Thomaston and Camden Maine. Located on 700 Acre Island, Maine. This is a small yard in a beautiful location with interesting boats. Custom joinery for boats is the specialty of this company. They build beautiful wooden boats from skiffs to yachts with the latest technology. They also restore antique wooden boats. This yard is located at the head of Belfast ME harbor. It is a big new yard with roots in several old Maine boatbuilding families. Chuck is a world class yacht designer that lives here in town. He also shows his oil paintings of marine scenes on his website. All photos, artwork and information are copyrighted by Peter Achorn and Fire Gold. © 1999-2015 all rights reserved. Any perceived copyright infringements are unintentional and will be removed upon request.